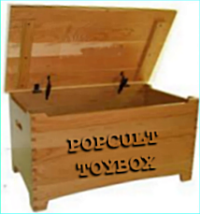 We wrap up our first year of The Popcult Toybox with a quick look into our second year. We will continue to bring you news, reviews, video and nostalgic looks back at toys almost every Tuesday. The aim is not only to appeal to collectors, but also to rekindle some of the love of toys that may still be buried deep in the souls of the non-collectors, and to help alert parents to cool upcoming toys for kids. In the coming year you can expect more coverage of action figures, fashion dolls, toy museums, coy conventions and automobiles both big and small. In February will we process the overload of information from the International Toy Fair in new York. In March we’re heading back to JoeLanta. We have lots more planned, so just keep reading PopCult. And feel free to use the comments to let us know what you’d like to see us cover here in the Toybox.